We raced to Ord Mantell and traced Fett's path to a junk droid dealer. Hello fellows...what brings you to Bent's Droid Parts shop? Can I interest you in an R4 motivator? Sorry Bent, we're looking for information not droid parts. We're tracking a guy named Boba Fett, do you know him? Oh sorry that's my assistant droid Bonk, don't mind him. I deal with a lot of outlanders but I think I know the guy...does he wear Mandalorian armor? If so, he passed through here yesterday. He bought a bibe sensor for an IG unit that he said he was going to pick up on Felucia. You've been a great help, we thank you. There are some great details in here. I really like the SNOT indent and all the droid parts cleverly scattered around. I like that SNOT ground and all the old droid parts in the background. But I am not so sure about that brown "building" maybe it would look even better with some grey colors in it because not it looks a bit like it is made out of wood. Oh and that little droid is quite a cute little fellow. 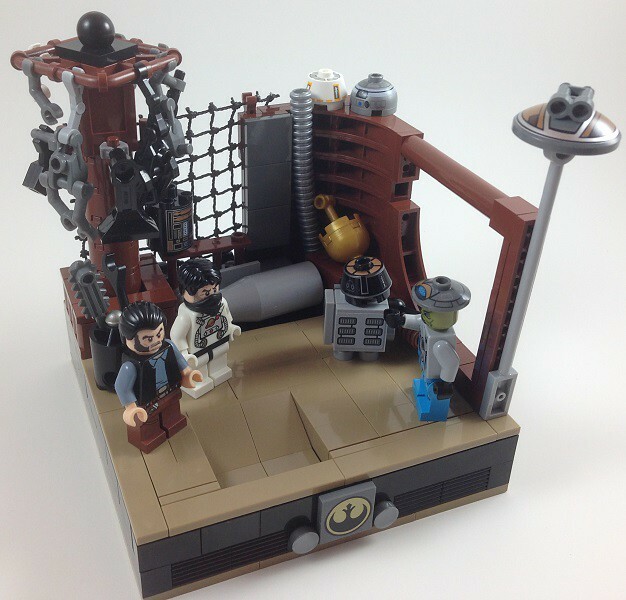 I must say I like this build a lot for its originality - subtle details and the various droid parts. That's a really cool vignette. Love the use of the net.